It has been 95-102 and as humid as the Congo for 2 weeks now, plus the lows at night haven’t dropped below 80 for a week. Relief is ahead, if you can call it that, as the lows are forecast to get into the mid to low 70s for the weekend and the forecast highs are “only” 90 for Saturday and Sunday. Maybe I’ll get some flowering and pollination again on the Brandywines; I haven’t noticed any new fruit setting for a while now. 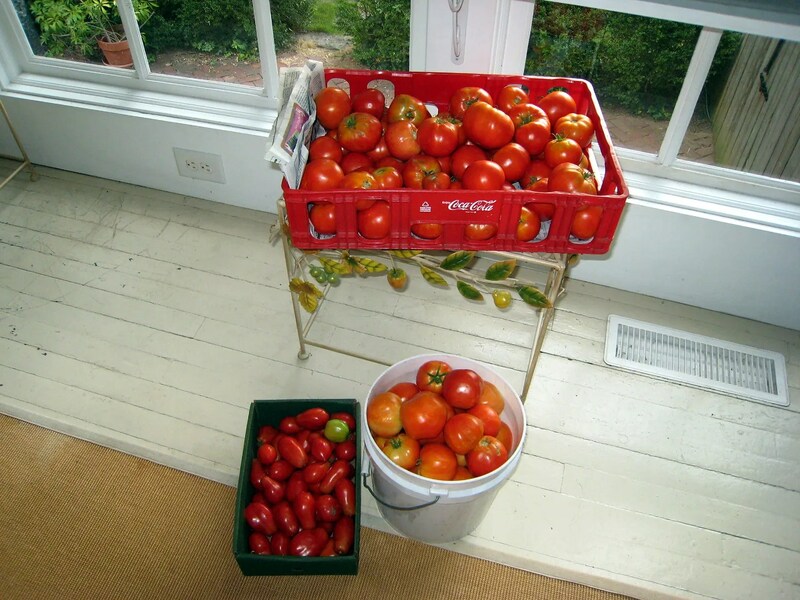 I still have a tomato conveyor rolling but they are a little smaller than July’s average fruit. They’ll perk up again in a few weeks and deliver a final fall flurry (assuming fall is coming this year). I really can’t complain though- the total harvest is over 1850 now. I’m pulling them a little earlier due to the stink bugs and some tomato fruit worms are getting more prevalent under the dense foliage of a couple of the Brandywine bushes.